It is no coincidence that around the time when America and Europe’s “surplus” women began to move into the workforce, women’s clothing took on a decidedly masculine appearance. The tailor-made, or as the French termed it, le tailleur, epitomized the new and public spheres which women began to enter. How, when and who invented the tailor-made is up for conjecture. Some accounts recount the visit of an English duke to his tailor, who made him a tweed suit so pleasing, the duke ordered a similar outfit suitable for his wife. Another story featured Alexandra, Princess of Wales, noting that when she and the royal trunks failed to make connections on the occasion of a certain ceremonious dinner at a brilliant English house-party, the Princess, too gracious to spoil her hostess’ plans, resourcefully directed her maid to cut off the skirt of her riding habit. The most credible story however, features the tailor commonly associated with the tailor-made, John Redfern. Accordingly, like most tailors of the late Victorian era, Redfern added a ladies’ department to his establishment. When Cowes became the center of yachting in the 1870s, Redfern adapted his designs for yachting outfits. The success of his flourishing business was assured when Lillie Langtry wore one of his train-less tailor-mades to the Cowes Regatta in 1879. 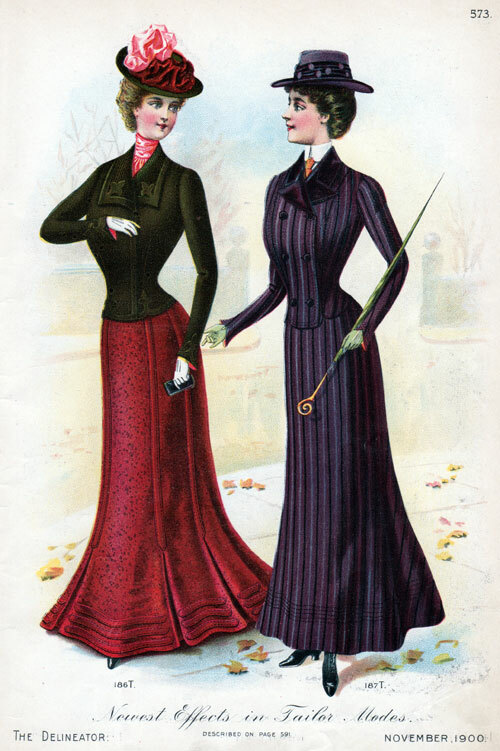 Despite being vetted by such illustrious women as the Princess of Wales and Lillie Langtry, among others, the tailor-made costume seemed to the older school repellently masculine. It was the first move towards a style signifying (unconsciously) that the wearer was engaged in some other pursuit than the capture of a man! This old-fashioned opinion was not helped by the growing numbers of women of all classes dining in public, taking up smoking, living and/or entertaining on their own, going about unescorted, and using slang! Though waistcoats for women with distinctly masculine connotations appeared in 1846, the tailor-made of the 1880s and 1890s, coupled with a four-in-hand tie, a shirtwaist, and a boater or another masculine hat style, was a strong statement for independence. She was known as the “fabulous Mrs. Lydig.” The daughter of a prominent New York family and descendant of the Dukes of Alba, Rita Lydig (née da Costa) was born for an opulent, dramatic life. At an early age she caught the eye of millionaire W.E.D. Stokes, collecting a cool million after divorcing him shortly after their marriage. She then promptly married sporting man and retired U.S. Army Captain Phillip M. Lydig with that million, and launched herself into a life of beauty, fashion and culture. She “belonged,” in the words of Vanity Fair editor Frank Crowninshield, “to the days and to the novels of Balzac, to the pages of Turgenev, the stories of Maupassant.” A romantic- and would-be literary- rival to Edith Wharton, she set Parisian society ablaze the moment she arrived at the Ritz loaded down with hairdresser, masseuse, chauffeur, secretary, maid, valet and forty Louis Vuitton trunks. She was a confessed shopaholic, never ordering one thing of a kind, but duplications of each item by the dozens, often with the slightest of variations in materials, lace or design. It was not uncommon for her closet to boast twenty-five copies of a favorite coat. However Rita didn’t dress for display; she dressed for art. Each item was but a piece on the canvas of her body, to convey a mood perhaps, or a “look” she felt that day. For her own pleasure she would dress herself in an antique gown made of 11th century lace which cost her $9,000. 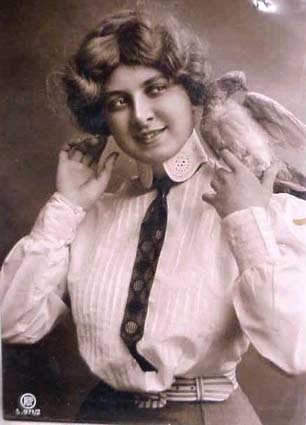 Daily costumes included black velvet dresses for day, low-cut and bare-backed evening gowns, jackets and coats of rich and rare materials to be worn with velvet skirts by day or satin culottes by night, black lace mantillas, small sable hats, and an umbrella stick of platinum with her name set in diamonds on top. She also brought her own linens, books, silver and objects when she traveled, and filled her hotel rooms (an entire floor) with white flowers. “Politicians bowed to her, painters painted her and sculptors sculpted”. But more than clothing and art, shoes were her first passion. True to form as a lady of society, Rita only walked short distances, yet she owned at least three hundred pairs of shoes. Each was specially crafted by the elusive Pietro Yanturni, the East India Curator of the Cluny Museum in Paris, who only created his feather-light, unique shoes for a select clientèle. Before he would even agree to add a woman to his list, he would demand a deposit of $1,000, from which he would subtract the price of each shoe or boot supplied, though delivery often took two or three years. If he accepted the lady as a client, he would make a plaster model of each foot, on which he would then work and mold his materials until they were as flexible as the finest of silk. The shoes he designed for Rita were fashioned from costly 11th and 12th century velvets, the toes varying between long and pointed, or square with square heels. Evening and boudoir slippers utilized brocades of gold- and silver-metal tissue, some covered with lace appliqué and leather spats that fit like a silk sock. To house these delicate, expensive shoes, Rita would collect violins to use their thin, light wood as shoe trees, and then these would be placed in trunks of Russian leather made in St. Petersburg, closed with heavy locks and lined with a rich cream velvet. In the midst of this opulent beauty, one would assume her life was a thing of beauty as well. By 50, her feverish pursuit of aesthetics led to financial ruin. She was barred from marrying Reverend Dr. Percy Stickney Grant by his bishop on the grounds of her previous divorce, and soon after, her health failed. Bankrupt and denied the pleasure of her life-long purchases, she died at 53 in relative obscurity in comparison to the fame of her earlier years.